Diefabrik’s Tombox+ plays homage to the loudspeakers of the industrial heyday, when music equipment was built to last. Companies such as Braun, Grundig, Saba and RFT spent good money to make their products solid and durable, and given their built-to-last construction, many can still be found in attics and cellars all around world. Building on a quality design, Diefabrik has made a commitment to restoring these bad boys of music history by giving them a new lease of life as modern day electronics. Diefabrik is a workshop in Leipzig, Germany, where innovative and sustainable products are created for a design oriented market, and the Tombox+ is the latest creation to be unveiled. Their commitment to reuse, preservation and creating quality products is clear. 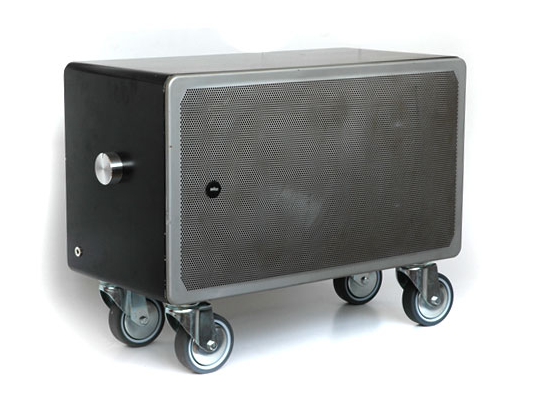 “We collect those seemingly useless passive loudspeakers and convert them into a portable stereo (active box). To do this we add a battery-run amplifier, a rechargeable battery, a loudspeaker control, audio cable with a 3.5 mm stereo jack and a handle, while we leave the shape of the loudspeaker untouched. With these additions the loudspeaker becomes a high quality and unique mobile hi-fi-unit with which you can listen to music from mp3 players, computers or cell phones” says Stefan Holldbler, product designer at Diefabrik. Loudspeakers of this size and age are pretty robust, so the Tombox+ can also be used as a sitting opportunity or as small coffee table. And if you like the style but don’t have the space in your home, there is a smaller (and cheaper – the full size runs for 300 Euros) little sister product, the Tombox, which is just as stylish. 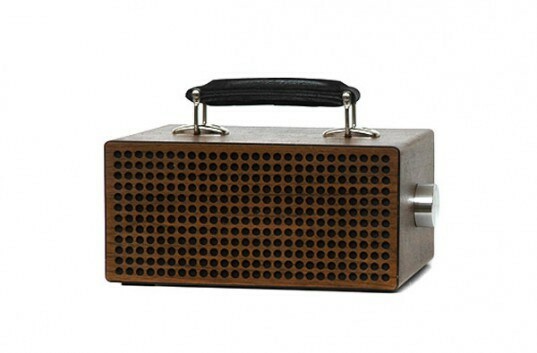 Diefabrik's Tombox+ plays homage to the loudspeakers of the industrial heyday, when music equipment was built to last. Companies such as Braun, Grundig, Saba and RFT spent good money to make their products solid and durable, and given their built-to-last construction, many can still be found in attics and cellars all around world. Building on a quality design, Diefabrik has made a commitment to restoring these bad boys of music history by giving them a new lease of life as modern day electronics.